The Filter Builder was designed to give users additional control over the display of trade data on the grid, and to allow them to run trade performance or gains and losses reports containing "customized" data. To demonstrate how this function works, we will consider an example. James executes a number of trades, each resulting in a profit of less than $20.00. He wants to run a Performance Report to measure his trading performance, but does not want the "wash" trade data included in the report. 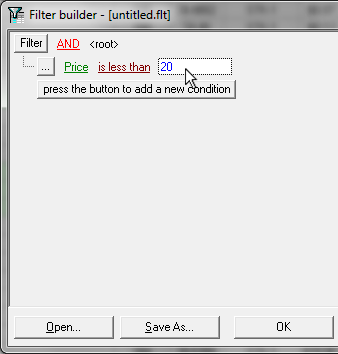 Using the Filter Builder procedure outlined below, James can filter all trades with a profit of less than $20.00 out of the grid and run the "customized" report. Click the Build Custom Grid Filter button on the toolbar to activate the function. (This button contains a red icon that looks like a funnel with a small "c" next to it, as shown below.) 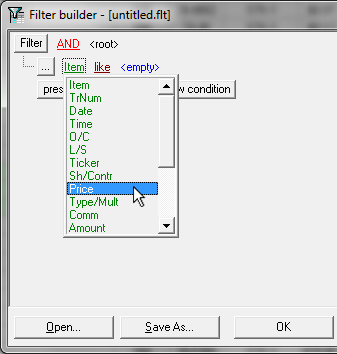 The Filter Builder window will open. The default root is "AND". To change the default root, click AND. A dropdown menu will appear. Select the appropriate root from the menu provided. Roots can be "AND", "OR", "NOT AND" or 'NOT OR". Each filter is comprised of one or more "conditions". Click on "press the button to add a new condition". A new row containing a default filter condition will appear. To run the new custom filter, click either the APPLY or OK button. The grid will now display the filtered data. To run a report based on the filtered data, click on the appropriate report in the Reports option in the main menu. To close the Custom Grid Filter Builder without running the new filter, click CANCEL. If you will be using this custom filter in the future, click SAVE AS. The Save the Active Filter to File popup window will appear. Navigate to and select the appropriate location in your computer to save the filter (the default location is your "tradelog" folder). Give the new filter a name and click SAVE. The new custom filter will be saved as specified. 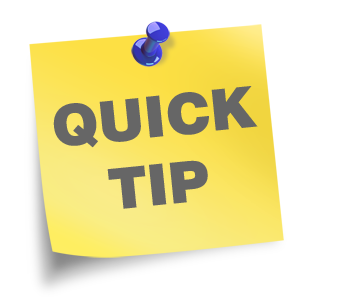 To edit a previously created custom filter, click the Build Custom Grid Filter button on the toolbar to activate the function. In the Filter Builder window, click Open. The Open an Existing Filter popup window will appear. Navigate to and select the appropriate filter and click Open. 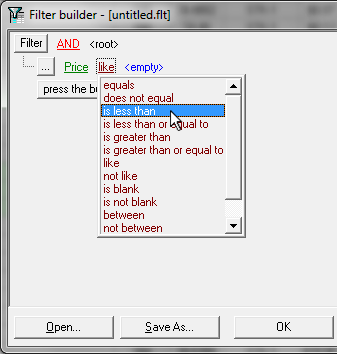 The filter will display in the Filter Builder window for editing. To refresh the grid to the default display (all trades listed by trade number and date of execution), click the All Trades button on the toolbar.